Olive oil is obtained from the olive fruit.Now a days this olive oil is mostly used in cooking.Olive oil is also used in cosmetics,soaps etc.Spain,Italy,Greece were the major olive oil producers in the world.1tbsp of Olive oil contains 119 calories. Eating about 2tbsp of Olive Oil daily reduces the heart diseases.Intake of this Olive Oil regulates the cholestorol level.Olive Oil protects us from the heart diseases.It replaces the bad chloestorol with good cholestorol. Olive oil is very useful for the skin.By rubbing the body with Olive Oil once a week,it will give the healthy glow to the skin.This Olive Oil is also used as skin moisturizer.Add few drops in the water and take a bath .That water makes your skin smooth. 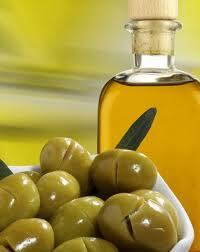 If you want healthy,silky and shiny hair you can use the Olive Oil for hair,even you can massage scalp with the Olive Oil.After applying the Olive Oil to your scalp ,cover your head with a towel and do head bath with a good shampoo after half an hour.It makes your hair healthy.This Olive Oil is also used for the removal of the dandruff and split ends. Applying the warm Olive Oil to your nails makes it healthier.For the nails growth you need the juice of tomato,2tbsp of Olive Oil.Mix the tomato juice and Olive Oil and soak your fingers in that mixture for ten minutes.This makes your nails grown. Olive oil is very useful to make your hands smooth.Take 1tsp of Oilve Oil and 2 tsp of Sugar to your hands and rub gently to your hands.After that wash your hands with warm water.It makes your hands look beautiful and smooth. April 10, 2017 at 10:47 PM delete This comment has been removed by the author.